Recently had work done on my m4 by the techs at bombup. Even though the gun is a cheap and not well liked brand. The work carried out can only be described as top notch. the way they got it firing is amazing so sharp and snappy. No sound from motor or gears just pop of the piston. Cant recommend these guys enough. From none firing to better than ever. Just need a new full metal body for it and I have a cracking bit of kit. 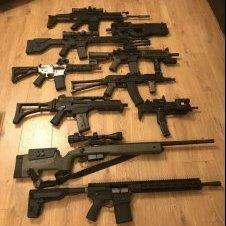 Not had any work done myself (a friend has and he spoke highly of them) but bought one of my pistols from these guys and I've browsed there a couple of times, seem like a great bunch and very helpful. Pricing is about average for a UK retailer with a good range of pistols, rifles, shotguns and gear - plus they have a handy "shooting range" for test firing too (almost a long cupboard but hey, it works!). Their website doesn't necessarily reflect the stock they have in store though so if you see something on there that you want to pick up I'd recommend giving them a call to make sure it's ready and waiting. Will definitely buy from them again in the future, there's not enough good physical airsoft shops around and I'll happily support where I can. thanks for the recommendation, I wasn't even aware of this shop. I will look it up and go visit in the next couple of weeks, I am at hunts cross so not too far away at all. where do you play infanteer? haven't started mate, in the process atm. Yeah, I fell for the 'in stock'. Ordered last Thursday and heard nothing, so I've just phoned up and apparently it won't be coming in until tomorrow so I'll probs get it on Thursday. Phoned up about a week before enquiringly about a scar H (was actually out of stock) and they said they weren't getting any in but I could pre order one. By the sounds of it, thy don't carry a lot of stock. Ordered the scar from wolf armouries and it arrived on the sat, 2 days later (and 2days earlier that expected which was nice). Also ordered a maple leaf barrel from wgc the before my bombup order and it's been installed on my gun for a day. They seem friendly enough over the phone, but if I can get something quicker from HK than I can get from a shop 20 miles away then there's something wrong.